Sustainability Governance and Hierarchy provides a solid, theoretically and empirically grounded reflection on the concept of "sustainability governance". This idea has been growing in popularity in social science literature, as well as among decision-makers and governance actors, as it brings together two vast fields of study that have sometimes been dismissed as vague or ideologically loaded. In order to link the concepts of "sustainability" and "governance", the book is organized around the exploration of hierarchy issues, which often lie in the background of the existing literature but are not the focus of analysis. The chapters reflect ongoing controversies and dialogue between scientists with different theoretical and thematic backgrounds, who are all willing to participate in and contribute to a constructive effort to reach a more inclusive and more theoretically relevant stage for sustainability studies, being content with merely global analyses. 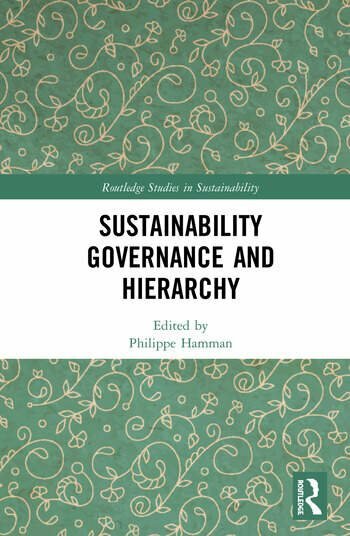 The book is an innovative contribution to the hierarchy/non-hierarchy debate regarding governance arrangements in the field of sustainability and sustainability studies. This book will be of interest to advanced students and scholars focusing on governance issues, sustainability studies, environmental studies, as well as on the methodological aspects of the social sciences (economy, geography, law, philosophy, political science, sociology, urbanism and planning). 6. (Self-)Governing Urban Energy Transitions: From Revolution to Evolution?